We are located on the corner of Olsen Avenue and Wintergreen Drive in Parkwood. Parkwood Tavern have become a great icon in the area for our delicious selection of food, great service and our excellent source of entertainment for the whole family! The Parkwood Tavern boasts a massive Entertainment Bar, TAB, Graziers Restaurant, Bistro and Lounge Bar. Our outdoor balcony and beergarden is a must see. Enjoy a meal from our brand new menu while you relax and the kids play in the kids playground. We are the #1 Entertainment Venue on the Coast, with many local and touring bands being announced throughout the year. Be sure to like us on Facebook for all our upcoming bands, events, specials and much much more. Whether you're unwinding from a long day's work, eager for some great live music, keen to shoot some pool or relaxing on a Sunday afternoon on the balcony, the Parkwood Tavern is the place to be. Welcome to Graziers Steakhouse, our restaurant seats 250 guests, has a casual style dining for lunch and dinner and we are open seven days a week. With our sun soaked outdoor dining area, and kids entertainment room, this is a delight for any parent. We offer mouth watering steaks with the right wine that perfectly compliments each meal. Everything on our brand new menu is a new experience where you can explore, discover new tastes and enjoy an unforgettable experience. Graziers Steakhouse have 7 premium steaks on the menu along with many other mouth watering dishes to choose from. Don't forget to check out our range of dessert and coffee specials to satisfy that sweet craving. Our Club 4 Kids recognises that eating out can be a very special occasion for the younger family members - an opportunity to try new food and have fun in a family-friendly environment. See below for all the latest food promotions & specials. Our Sports bar is complete with 3 bars and 13 different beers on tap. Including Carlton Dry, Great Northern Super Crisp Lager, Hahn Super Dry, XXXX Gold, Carlton Midstrength and Tooheys Extra Dry, there is a great range to quench everyone's thirst. Our TAB has everything that the avid punter needs, showing both Sky channels on 16 plasmas you won't miss a thing. We also have 5 touch screens and 3 TAB terminals so you will never miss a race. If it's sport you like, we have plenty of plasma screens to watch FOX 1, FOX 2 FOX 3 and all Sky channel boxing and UFC events. 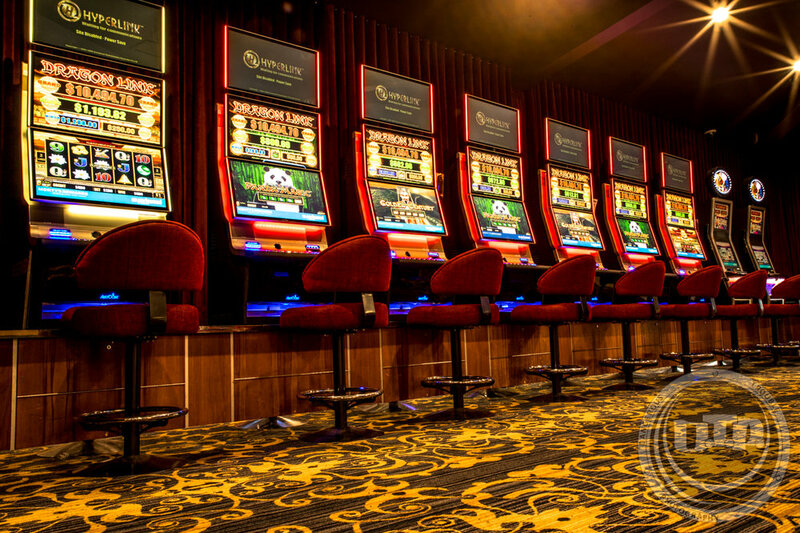 Here at Parkwood Tavern our comfortable Gaming room features 45 of the latest gaming machines, Keno terminal, and link jackpots including the latest Cash Climb and Lightning Link Machines. We have Ticket in Ticket Out system operation on our machines allowing you to move quickly and easily between machines. To add to your experience we provide complimentary tea, coffee and soft drink for machine players, as well as delicious snacks including fresh hot popcorn every day and delicious toasted sandwiches. For those who would like something else, we also have an easily accessible Gaming Bar with a range of refreshments available. Our comfortable Keno lounge area is ready for you to enjoy an espresso and watch your numbers come up so you'll never miss a game.